the country as a whole and most metro areas. Some 13.8% of the population of the 100 largest metropolitan areas in the country is black. 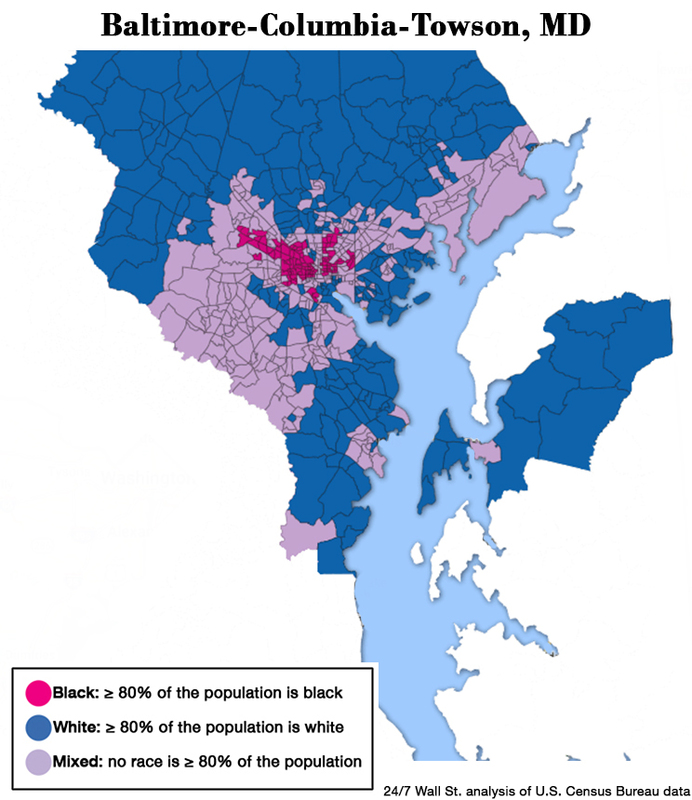 Segregation in Washington largely occurs along the Anacostia River, with many poor, black neighborhoods concentrated in the southeastern parts of the city. Wealthier white communities, meanwhile, are situated in surrounding suburbs such as Arlington, Virginia and Frederick, Maryland. Dozens of tracts in Southeast Washington D.C. have less than 1% white residents, and many tracts in the northeast have less than 1% African American residents. Unlike other highly segregated, large cities like Washington, D.C., Dayton has a relatively small nonwhite population. 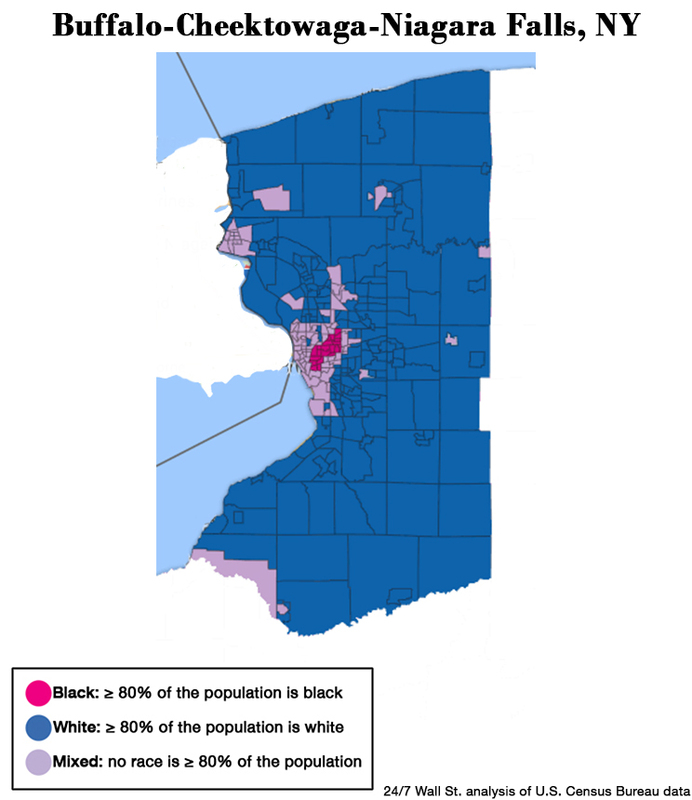 More than 77% of the Ohio metropolitan area’s 800,000 residents are white. Of those, 467,000, or over three-quarters, live in mostly white neighborhoods. Also, about 13% of the white population is impoverished. Of the area’s relatively small black population, about 30% live in predominately black neighborhoods, and almost 35% live in poverty. 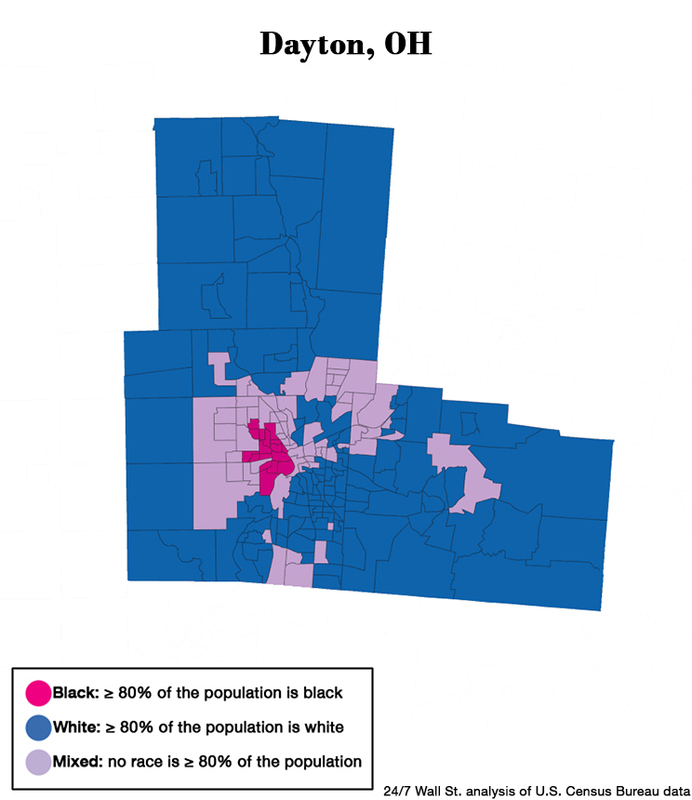 In all, 62.8% of Dayton’s population lives in a neighborhood that primarily consists of their respective race, one of the largest shares of segregated residents nationwide. In 1966, some of the worst race riots in the Dayton’s history were likely caused by the city’s discriminatory housing policies that resulted in the heavy racial segregation that persists today. As school systems nationwide were ordered to desegregate, Dayton was the last Ohio city to be awarded racially unitary status — that is, the federal government no longer found its schools segregated based on race. Still, although the city no longer enforces segregation by law, the Dayton school system remains largely segregated today. Atlanta is one of the most diverse metropolitan areas in the country. Today, nearly one-third of the Atlanta population is black, seventh most among the 100 largest metropolitan areas. Nearly one-third of the black population lives in mostly black neighborhoods. lives in a predominantly black neighborhood. However, compared to many racially segregated cities, while inequalities still exist, outcomes are not as bad for Atlanta’s black residents as they are for black residents in other cities. Atlanta has one of the highest African American adult educational attainment rates, one of the highest black homeownership rates, and one of the higher median incomes among large metropolitan areas for black households. Atlanta’s African Americans still fall well behind the metropolitan area’s white residents by all these measures, however. One of the most immediate and severe consequences of segregation in American cities is the ongoing differences in educational outcomes. Because property taxes are a major component of local school funding, regional income is one of the largest determinants of school quality and educational attainment. Like in most of the country, there is a large income gap along racial lines in Baton Rouge. The typical black household in the Louisiana capital earns $34,914 a year, nearly half the $65,842 the typical white area household earns. 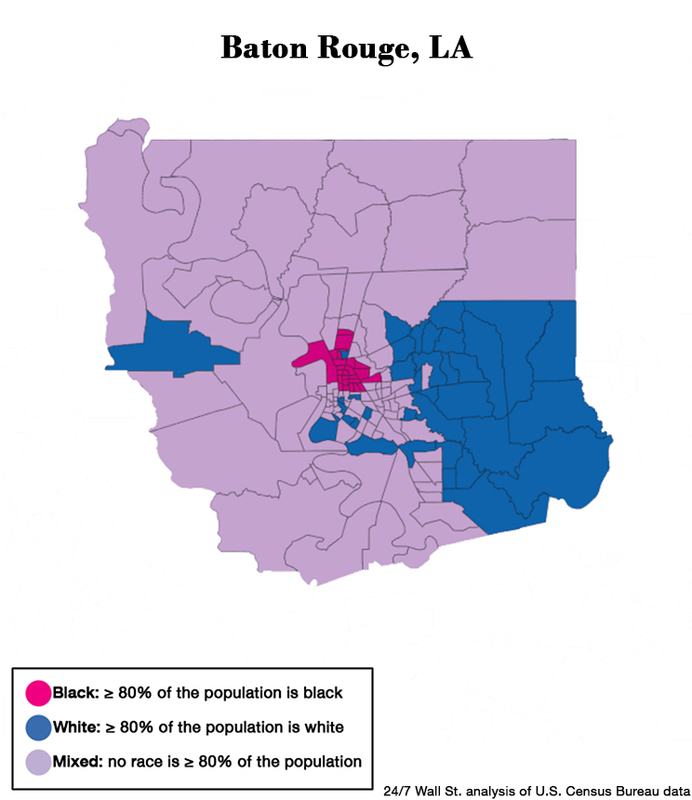 Because Baton Rouge is one of the most segregated metropolitan areas in the United States, this translates to a significant disparity along racial lines in educational outcomes. The high school education attainment rate among black metropolitan area adults is just 80.9%, roughly 10 percentage points less than the 90.8% white high school education attainment rate — one of the larger disparities of any major metro area. Philadelphia has a long history of racial violence and segregation. One of the first race riots of the civil rights era erupted in the city in August 1964 after two police officers forcibly pulled a black woman from her car. The riots resulted in over 700 arrests and 200 cases of property damage. In 1985, the Philadelphia Police Department firebombed a house containing some members of a racial activist group after one of its members had shot and killed a police officer. In total, 11 people were killed, and the resulting fire destroyed 61 homes. Today, about 43% of the City of Brotherly Love’s population lives in a racially homogeneous neighborhood, about 10 percentage points higher than the average across the 100 largest U.S. metropolitan areas. Of the city’s black population, 15.6% both earn poverty wages and live in high poverty neighborhoods, compared to less than 1% of the city’s white population. Across the nation’s 100 largest metropolitan areas, slightly less than 1 in 3 residents live in a neighborhood where at least 80% of the population shares their race. In Milwaukee, 56.6% of residents live in such neighborhoods. 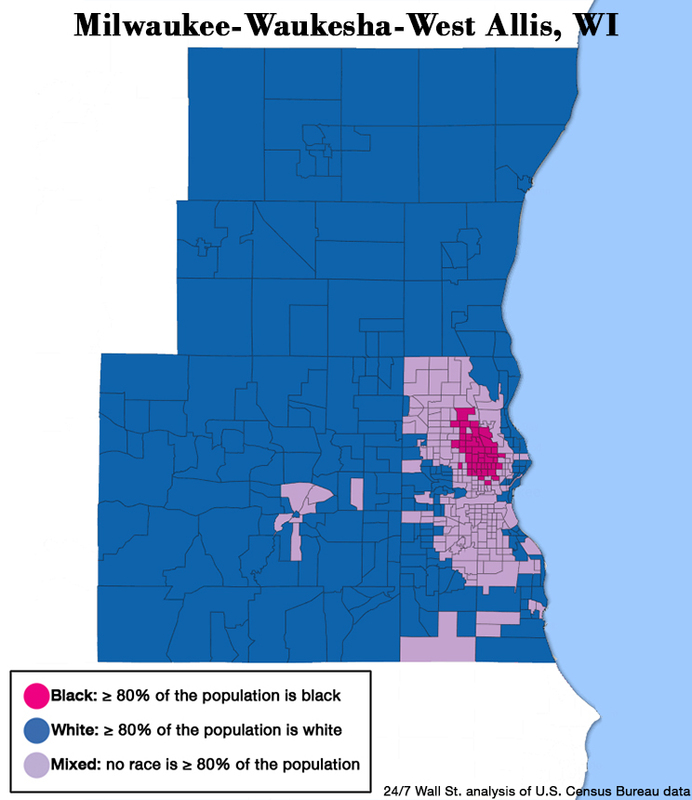 The city’s quarter million black residents, which make up about 16% of the metro area’s population, live largely in Milwaukee County, while the metropolitan area’s majority-white population lives in the city’s suburbs, in Waukesha, Ozaukee, and Washington counties. Likely a consequence of ongoing racial segregation is the major difference in poverty rates between the city’s white and black residents. Likely a consequence of ongoing racial segregation is the major difference in poverty and education attainment between the city’s white and black residents. Just 1.2% of Milwaukee’s white residents live in neighborhoods that are largely impoverished, and 38.6% have a college degree. Almost 30% of the metro area’s black residents live in high poverty, and only 12.7% have a bachelor’s degree. One of the most famously disastrous cases of racially segregated government housing happened in St. Louis. In the mid-1950s, the federal government constructed several dozen 11 story middle-class public housing towers in two projects that would collectively be called Pruitt-Igoe. For a time, the towers were segregated — blacks lived in Pruitt, while white families lived in Igoe. After racial discrimination was outlawed and black and white residents were allowed to live together in the combined Pruitt-Igoe, most whites moved out, and a lack of care led the structures to fall into disrepair. Both crime and vacancy rates rose, until the towers were demolished and all remaining tenants were relocated. Richard Rothstein, researcher for the Economic Policy Institute, says that Pruitt-Igoe and other segregated public housing projects in St. Louis contributed to current racial inequalities in the St. Louis area, including the substantially higher educational attainment rates among the city’s white residents, as well as a poverty rate among black residents that is three and a half times higher than among the white population. Birmingham is often considered one of the most important cities in the development of the American civil rights movement during the 1960s. Martin Luther King Jr. focused his efforts to end segregation throughout the United States in Birmingham, and the city was the site of numerous sit-ins, marches, and nonviolent protests. The highly publicized violence with which peaceful protesters were met, as well as the bombing of the 16th Street Baptist Church that killed four young girls, galvanized the movement and caused it to spread throughout the country. Given the city’s historic significance in the civil rights movement, it is especially regrettable to see how how segregated the city is today. Over half of the city’s 1.1 million residents live a racially homogeneous neighborhood that shares the same race as them. As is the case across the country, the city’s black population is far more likely to be poor, and far less likely to be employed and well educated, compared to the city’s white population. 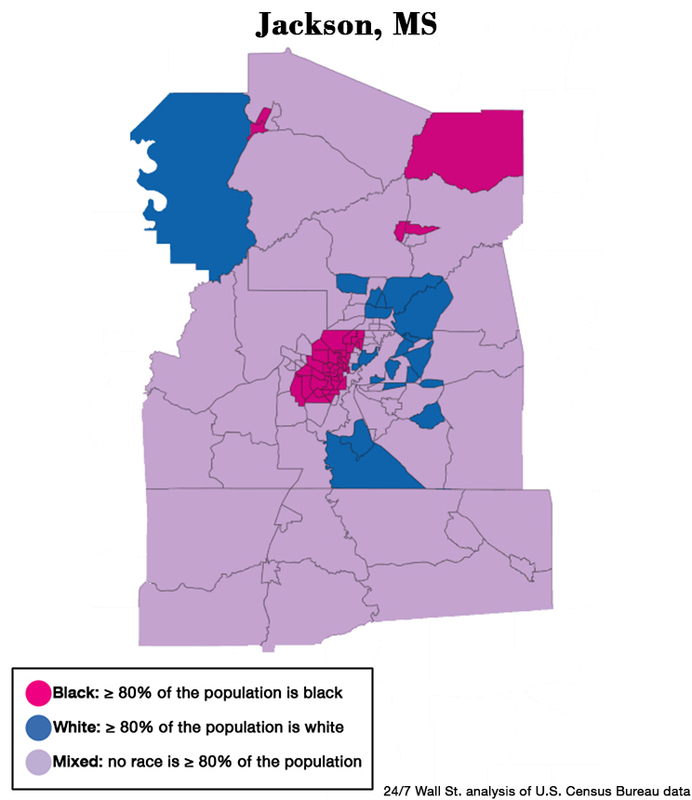 Less than 1% of the metro area’s white residents both live in poverty and live in neighborhoods where a large share of the population is also poor, compared to more than 15% of Birmingham’s black residents. About 12% of the U.S. population is African American, and in none of the 100 largest metropolitan areas do black people represent a majority of the population. In Memphis, 46% of the population is black, the largest share of any major metropolitan area other than Jackson, Mississippi. There are many negative consequences of living in high-poverty neighborhoods that extend beyond the basic struggles of poverty. Those living in areas where a bulk of residents earn poverty wages are less likely to have access to educational and employment opportunities and are far more likely to remain in poverty. In Memphis, extreme poverty affects African Americans far more than white residents. 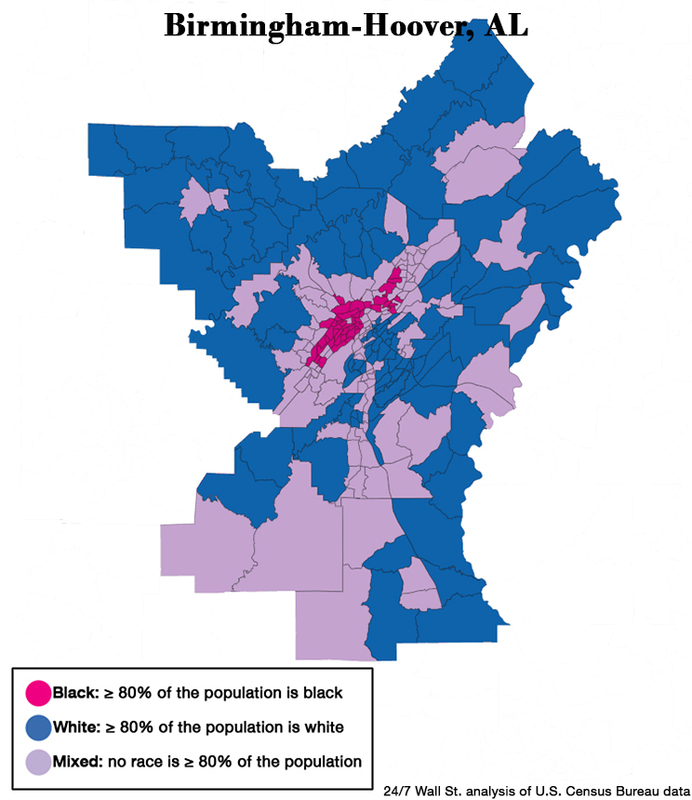 Just 2.3% of white Memphis residents live in neighborhoods where are least 40% of the population is poor, compared 20.5% of the black population. Jackson, Mississippi residents who are black are far more likely to live in predominantly black neighborhoods than African Americans in nearly every other U.S. metro area. The metro area’s black population is concentrated in downtown neighborhoods within the city proper. 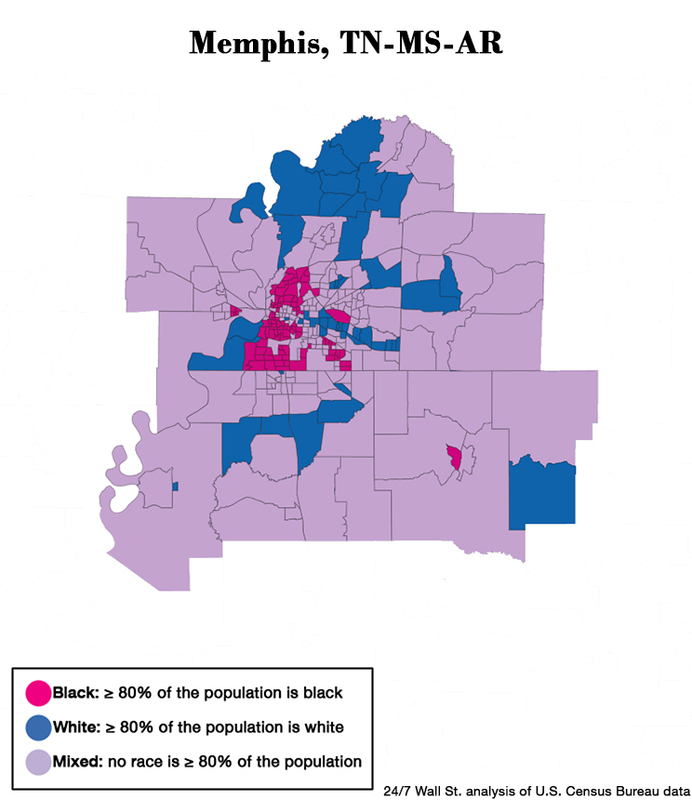 While in many of the most segregated U.S. metro areas the black population is far worse off economically it is nationwide, Jackson is an exception in many ways. For example, only 12.8% of the area’s black workers are unemployed, the third smallest black unemployment rate on this list. Additionally, Jackson’s 53.9% black homeownership rate is the highest of any major metro area. However, Jackson also has the highest white homeownership rate among large metropolitan areas, which, at nearly 80%, dwarfs that of the African American population. Attracting many immigrants into America in the 19th and 20th century, the Chicago metro area has long had one of the most diverse populations of any U.S. city. In recent history, however, exclusionary zoning, white flight, and racial prejudice have intensified segregation in the city and worsened economic outcomes for minorities. Today, more than 50% of all African Americans in Chicago live in neighborhoods in which at least 4 in 5 residents are also black, the second largest share in the nation. 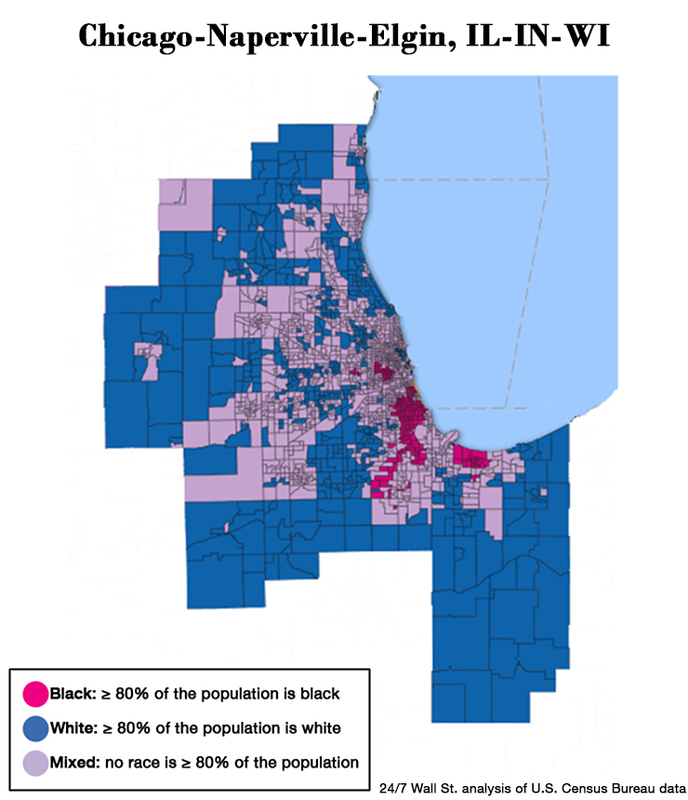 While 7.2% of white residents in Chicago live in poverty, 29.0% of black residents do. The black poverty rate is more than four times the white rate and is the second largest poverty disparity between blacks and whites of any metro area. Once the fourth largest city by population and wealthiest by income per capita, Detroit’s economic decline over the past several decades has been one of the deepest of any U.S. city. The population of Detroit’s city proper today is approximately one-third what it was at its 1950 peak of 1.8 million people, and it continues to decline at a near nation-leading pace. As wealthier, white residents left the city in search of jobs and better living conditions, many poorer, black residents could not afford to move and stayed in the declining city. Such white flight intensified segregation in the city and worsened economic outcomes for minorities. 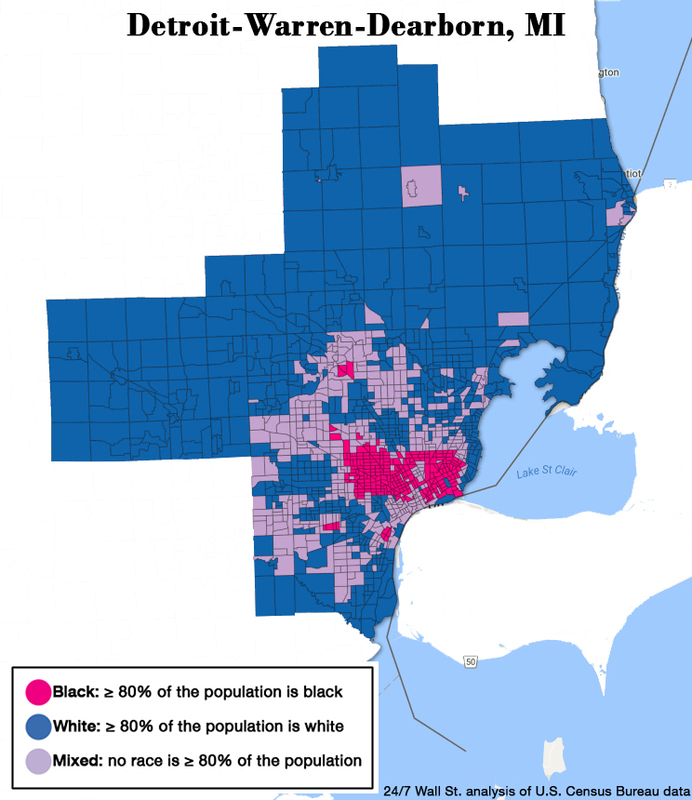 Segregation in the city is delineated by 8 Mile Road, a beltway that acts as a physical and cultural divide between the city’s wealthy, white population and its poor, African American communities. Today, 55.3% of Detroit’s African American population lives in neighborhoods where at least 4 in 5 residents are black, the largest share of any U.S. metro area. There are many negative effects of ongoing segregated housing in U.S. metropolitan areas. For example, black families in America tend to have lower incomes than white families, and so largely black neighborhoods are far more likely to be highly impoverished. In the largest metropolitan areas, 25% of the black population lives in poverty, compared to 9% of whites. In some of the cities on this list, more than one-third of black residents live in poverty. A number of studies have shown that people living in highly poor neighborhoods suffer from negative consequences that extend beyond poverty. Because of both the higher likelihood that African Americans live in poverty and because of racial segregation in cities, the concentrated poverty rate in the largest metro areas is virtually nonexistent for whites — just 1.4% of the white population lives in highly poor neighborhoods. Meanwhile, 12.4% of black residents live in such neighborhoods. In these highly segregated cities, black residents are even more likely to live in extreme concentrated poverty. In seven of the cities on this list, more than 20% of black residents live in neighborhoods where at least 40% of the population is poor. In Detroit, the most segregated major metropolitan area in the country, 1 in 3 black residents live in highly impoverished neighborhoods. Another serious consequence of segregation in these metropolitan areas is the effect it can have on the public school system. School funding is largely determined by property tax revenues. In metropolitan areas with low-income black neighborhoods and affluent white areas, the white schools will likely be much better funded. This means the children living in black neighborhoods face much greater obstacles for success. Not surprisingly, the less racially integrated metropolitan areas in particular have poor educational outcomes for African Americans. 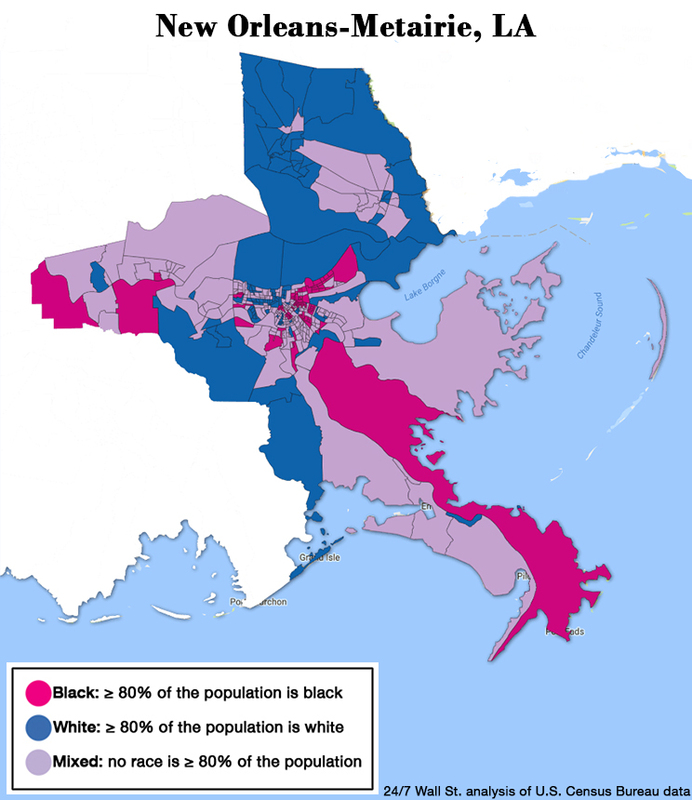 In New Orleans, for example, 90.8% of white adults have a high school diploma, while the high school attainment rate for black adults is 79.6%. To identify America’s most segregated cities, 24/7 Wall St. calculated the percentage of metropolitan area black residents who live in predominantly black census tracts — statistical subdivisions with an average of about 4,000 people. The greater the share of black metro residents living in the area’s racially homogenous neighborhoods, the greater the degree of segregation. We only considered census tracts with at least 500 residents in the 100 largest metropolitan areas. Population data are based on five-year estimates through 2015 from the U.S. Census Bureau’s American Community Survey. For the purpose of this story, we only considered segregation of white and black populations. Because a certain level of racial diversity is necessary for segregation to be measured with confidence, only 74 of the 100 largest metro areas could be compared. The remaining 26 were not considered because they do not contain any predominantly black census tracts. While racial segregation was the primary focus of our analysis, segregation by income is also an important component. Our analysis included the share of a metro area’s population living in extreme poverty — census tracts with poverty rates higher than 40%. This portion of our analysis excluded tracts with fewer than 500 residents, as well as tracts where more than 50% of the population was enrolled in either undergraduate or graduate school. We also reviewed median household income, poverty rates, educational attainment rates, unemployment rates, and homeownership rates among black and white populations in each metro area from the ACS. All data are five-year estimates.